Coaxial Isolators are used to help eliminate the hum and horizontal bars caused by ground loops. When two or more devices are connected to a common ground through different paths, ground path noise or a ground loop can occur. This is actually quite common in home cable systems, even those that are well designed. The result of a ground loop is audio hum and/or horizontal bars in the TV picture. 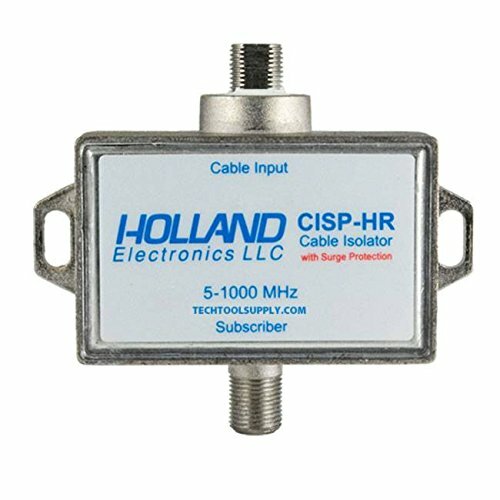 The Holland cisp-hr Coaxial Shield Isolator creates an electrical "open" on the coaxial shield. The isolator allows cable signals to pass regardless of whether a ground differential exists between the two connection points. Its flat frequency response is ideal for most all cable TV applications. It is virtually invisible to cable boxes and cable modems. With years of experience in surge protection, Holland produces the best products to protect your broadband equipment. Buy with confidence from a well-established name in the the business. When properly installed, this product isolates one device from the rest of the cable ground system. It is fully compatible with ALL cable TV services such as Cable Modems, ON-Demand video, Digital Cable, and more. Prevents unwanted ground loop current on the shield of the cable, which can cause noise and degrades picture quality. Designed to work with today's high bandwidth CATV networks. Unit comes standard with "F" type Male-Female connectors. Product shows superior RF performance operating at a frequency range of 5 - 1,000 MHz. Maximum insertion loss is 1.0 dB. at 1 GHz. Robust design housing that provides excellent RFI shielding of > 85 dB. Housing is environmentally sealed against moisture and humidity. If you have any questions about this product by Holland Electronics, contact us by completing and submitting the form below. If you are looking for a specif part number, please include it with your message.